The London Underground is fast, reliable (mostly), and gives us a bit of time to detach from the rest of the world for a moment or two, whether that be through listening to music, sleeping, or reading a book. But have you ever tried turning the pages of a book whilst pressed up against other commuters who are, probably like you, trying their best to avoid eye contact? It wasn’t until 2007 when Amazon released the first Kindle that these travel woes could be cast aside. Since then, Amazon has kept us turning their e-pages with over 10 different iterations of the original model, and we can now access a vast database on the go, with over 20,000 books available. Despite the first e-reader being introduced in 1998 with the Rocket Ebook, e-readers weren’t fully adopted into our cultural psyche until the Kindle, which uses electronic paper technology to mimic paper ink on its display screens. While it’s true that there have been concerns that the Kindle would see people begin to choose ‘pixels’ over ‘paper’; rather than wiping out the printed press, e-readers and traditional paper books have instead ‘kindled’ together ten years on. People seem to use both in equal measure, depending on where they are and what they’re doing. This is most likely because of the balance between the sheer portability of the Kindle and the ‘homey’ sentimentality one gets with a physical book. For people who are on the move a lot of the time, the Kindle lends itself useful in countless scenarios where you’re out and about. It’s also helping to change our general perceptions of the environment. 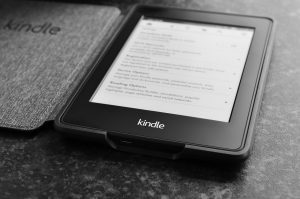 Kindle brought paperless technology to the mainstream foray, and in the last ten years there’s been a flurry of organisations going paperless, both to become more environmentally-friendly and more cost-effective as a business. But perhaps as importantly, the Kindle has made tube rides just that little bit more bearable!